Here's an explanation of the functions accessible from the file menu. If you play multiple lotto or keno games, you can load each of these games as you need them into the program using the load game function. Use the file requester screen that comes up to locate the name of the game you're looking for. Select it and press the open button. There will be a pause while the game loads. You can also load game files by pressing the Load button on the main screen. Choose this menu item when you need to create a brand new game. It will clear the last game from memory, and allow you to specify all the pertinent facts of the game you want to track. You can also get to the define game screen by pressing the Edit button on the main screen. You will notice that you have up to three sets of numbers to work with, with up to 99 digits each. This is more than you should need for any typical lotto or keno game. Use the first set for the lotto number - set the number of digits and the highest number used in the game. If your game has a powerball, bonus or other extra number, then use the second number set. Set the number of digits to one (unless there is more than one bonus number), and set the highest number possible for the powerball. Typically, you will not need the third set of numbers. Set this and anything else you do not need to zero. The Numbers Can Repeat question should always be answered Don't for lotto or keno games. It is answered Do only for lottery games (pick 3, pick 4.) When specifying a single powerball or bonus ball on the second or thrd line, set this for Don't if the extra ball is picked from the same ballset as the main lotto digits are picked from. Set it for Do if the bonus ball comes from its own separate ball set. Be sure to give your game a name that is short but descriptive. At this point, setup the system (picks are based on) you wish to use with this game, and the lookback and looseness setting you want to use (you don't have to decide these things permanently, though, you can still experiment with them.) Good starting values are 50 for lookback, and 10 for looseness. After your game is all set up, you will need to choose save from the file menu to permanently save it. Delete Game clears the memory of Analysis Lotto, but does not erase the game from the disk, if you've saved it there. When you choose Save from the File menu, you are saving just about everything you see on the screen to the currently loaded game name. The next time you load the game, you will not only get the game setup and the history files, but also the same chart, the same filter entries and calculation settings. 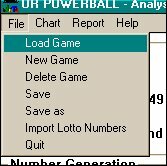 An important note: even without performing a save, when you start Analysis Lotto, the last game you loaded will automatically start, and all the options will set up exactly the way you left them the last time you ran the program. But the settings of the options have not been saved with the game file, unless you explicitly execute a save. The same as choosing Save, except that you will be able to specify a file name. Using the Save as option, you can make a new game which is similar to an existing game. In other words, give an existing game a new name (you haven't erased it, the game will still exist under the original name on the disk) and then make whatever changes you want the new game to have. Save it, and you're done, except for the entering of game history data. Import is a powerful but advanced feature, which can save a lot of time getting past drawings into the computer. However, if you find the directions overly complicated, don't worry. You can use the Add Latest Number button instead, and enter the numbers one at a time. See the main support page to see if there are specific import instructions for your game. Using Analysis:Lotto's advanced import feature, you can build a database of historical information very quickly and easily (the program analyzes this data to help choose the optimum numbers.) The internet is host to hundreds of sites that have data on past lotto drawings. Once you find a list of drawings and winning numbers for your game, how do you get that data into Analysis Lotto? Here's the easiest way: first, find the data you want on the internet. When you have the lotto numbers on the screen, either choose Select All from your browser's Edit menu, or else select the numbers you want with the mouse, by holding down the left button and dragging the mouse across the table of numbers. Release the mouse button when you have selected the numbers you want (they will be displayed in a new color.) When the numbers you want are selected, choose Copy from the same Edit menu. As you are doing this, notice some things about the data you will need to know. Are the newest drawings listed at the top of the list or the bottom? Does the list of drawings contain only the game you want, or are other games mixed in with it? Some lottery data comes in spreadsheet form. Analysis Lotto cannot read spreadsheet file formats directly. Instead, load the file into a spreadsheet program like Excel or Open Office Calc, and copy the columns of data you want onto the Windows clipboard by selecting with the mouse then choosing Copy from the spreadsheet's Edit menu. Note: when selecting spreadsheet data with the mouse, take care not to accidentally select large numbers of blank spreadsheet cells. Another way: You can also import by first saving the data you want into a text file. Once the information is on your internet browser's screen, choose save from the browser's file menu, and choose text as the file type you want to save. Remember the name, and the place on your hard drive where you are saving this file, as you will need to find it again when you run Analysis Lotto. Better still, place the file in Analysis Lotto's data directory. Before leaving the website, double-click on the file you saved and look at it. If there's a lot of extra info there, besides your lotto numbers, go ahead and erase it, then re-save the file. Note: often, especially on websites that use tables or frames, the lotto number data will simply not save right. In this event, use the Copy/Paste method above instead. Now you're ready to start up Analysis Lotto. Make sure you've loaded the lotto game you want to add the data to, and that the data you want to import matches the game you've got loaded. Choose import from the file menu. There are a number of features on the Import screen, but some of them are for solving problems with data, and you should not need them under most circumstances. For the most part, you can look at the red boxes that appear on this screen for hints on which step is next. If you instead saved your data as a text file in a previous step, press Choose File instead of Paste - and use the file requester to locate the text file you saved earlier. When using this method, the data will not appear on the screen (until you press Go) and you will not be able to edit it. Make sure the intelligent import box is checked, and click the GO button. After a moment, the data will appear again in the import window. It has not yet been added to your history file, and won't be unless you press ADD or REPLACE. Examine the imported data closely. If the most recent drawing appears on the top of the list instead of the bottom, the data is backward. To fix this, check the reverse import order box, and click on Paste and then GO again. Now the data will import in the opposite order. When you look at the imported data, you will notice that the data that the computer has recognized is listed first (along with the Delta number in brackets), followed by a colon, and then the raw line that the computer tried to interpret appears to the right. Compare the recognized number with the one that appears to the right, in that original line, and make sure the computer has recognized the correct numbers from the right game. If you see anything unusual, like the same number repeated on all the lines, or larger than normal numbers, something may have gone wrong. If there are any problems, read below for solutions. If the data appears correct, you are almost done. You can now click the Add button to add this data to your existing database of lotto numbers. If you have no existing database of numbers, or if this new data should replace it entirely, then press the Replace button instead. If you changed your mind, the Cancel button throws away the new data and closes the import screen. As you can see, all the various lottery and lotto games that Illinois runs appear mixed together in the same list. Trying to import this file results in a mess. If what I want is only the Little Lotto game, I can enter "Little Lotto" (including the quotes) in the Filter window. The quotes tell the filter to look for the whole phrase only. Now when the GO button is pressed, we get the Little Lotto drawings only. Suppose I had left off the quotes? Then the filter would have looked for any line containing EITHER the word Little OR the word Lotto, and both the Little Lotto and the regular Lotto numbers would have been chosen - not what we want. Also, the filter recognizes the words AND and OR, so instead of the quotes in my first example, I could instead have entered Little AND Lotto in the filter window, to get the Little Lotto results only. Suppose, in the above example, that we want the regular Lotto game only. If I filter on the word Lotto, I'll get both the regular Lotto game and the Little Lotto, as both of these lines contain the word Lotto. Here's the trick: use a minus sign in front of the word you don't want, like this: Lotto -Little. The filter will find all the lines containing the word Lotto, but throw out lines containing the word Little. If you are successfully importing the right lines of your file, but the actual lotto numbers are not being recognized correctly, we will have to use the This position in each line box. Click the Paste button again and re-examine the lotto numbers. Count over the number of characters from the start of each line to the place where the first lotto number appears. This is the starting character position, enter this number in the first box. Sometimes, you can't figure out what this number should be because it's different on every line. In this case, try the Count this text box. This box is for the character that you want to count - in other words, if there are three commas that occur in the line before the good data starts, type a comma into the box, and put a number 3 in the first this position box. This tells Analysis Lotto to count over three commas before looking for lotto data. You can count anything, spaces, dashes or entire words or phrases by typing it into the Count this text box, and putting the number of them to count in the first box. If there is any bad data that occurs between digits of your lotto number, note the starting and stopping position for this section, which you can enter in the Exclude Text section of the import window. These boxes aren't afected by the Count this text box, every character is counted. Leave both boxes set at "1" to disable this feature. The intelligent import checkbox enables smart date checking. Usually Analysis Lotto can identify dates so as not to mix them up with game numbers. If you suspect it is not working correctly you can disable it by unchecking this box. You can also use the import screen for manual entry of numbers. Instead of pasting or loading numers, just click on the number window, and type the numbers right there. When done, press GO, check that the computer recognized the numbers correctly, then Add. If you choose Export from the file menu, you can save a plain-text file of Analysis Lotto's historical or generated lotto numbers to your hard drive, which another lottery program or a spreadsheet program like Excel can read. Just choose either Export Historical or Export Generated and give the exported text file a name to save to your hard drive.